In this week's parasha (Ekev) we see Eretz Yisrael described as a land whose "stones are iron" - אֶרֶץ אֲשֶׁר אֲבָנֶיהָ בַרְזֶל (Devarim 8:9). 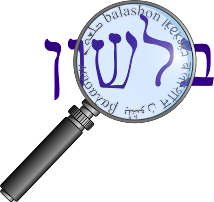 What is the origin of the Hebrew word for iron - barzel ברזל? Semitic przl/brzl/brdl, "Iron"* Rendsburg starts off stating that the etymology is most obscure. He eventually proposes an original *br, borrowed from some non-semitic proto-language, meaning copper or metals in general, from which came *brz which he took to be an early word for iron. The addition of -l to make brzl came later in Canaanite, Akkadian and Ugaritic which were probably borrowing from each other (p.55; fig.1, p.58). Rendsburg also links *brz with Indo-European bronze/brass. Stahl writes that barzel derives from ברז, meaning "to drill, bore". In Aramaic we have the word birza ברזא - a hole in a barrel, which became the source of the modern Hebrew word for spout, faucet - ברז berez. A loan word from Hittite barzillu, whence also Akkadian parzillu, Moab. and Phoen.ברזל, Ugar. brsel, Aram. and BAram parzel פרזל ( = iron). Arabic firzil is an Aramaic loan word. Latin ferrum (= iron) is a Semitic loan word. According to my opinion the loss of the Semitic ending -el, resp. -illu, is probably due to its having been mistaken for the Latin dimin. suffix -ellus, -illus, and consequently dropped. Kutscher agrees that the word barzel does not seem and sound Semitic in nature. As far as the connection to the Latin ferrum (the source of the symbol Fe for the element iron), he provides an interesting piece of evidence. There is an ancient iron mine in Italy, on the "route of the iron", called Fursil (near the Castle of Andraz) whose name is remarkably close to parzel. Perhaps this place preserves the original Latin form of the word.